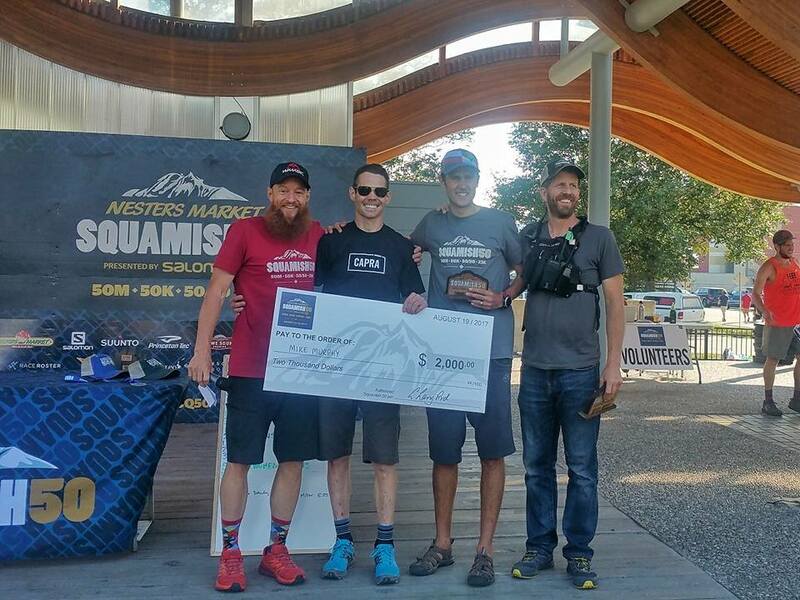 Let me start off by saying that winning the Squamish 50 this year is probably the highlight of my ultra-running career. Not because of the cheque or trophy, but because it happened while surrounded by family and friends, and in the amazing community that I now call home. I’ve been living in Squamish for a year now, and the support I felt out there on Saturday was off the charts. Add to it that Gary is a great friend, and that I feel as if I know most of the race volunteers. Honestly, I really did have all the good cards in my hand. The super short summary is that I woke up Saturday morning feeling strong and motivated - looking forward to the opportunity to really lay it down out there. In fact, everything was going exactly to plan all the way to the top of Climb Trail. My legs felt amazing, and I was on track to run around 7:45, but then came the crippling leg cramps… and 7:45 turned in to 8:10. Oh wait, I guess I should mention the less-than-auspicious start to my day. Three minutes before the start of the race I rolled my ankle on a rock in the parking lot. My day was almost over before it started. Thankfully, I am incredibly stubborn and was more than willing to sacrifice my long-term ankle health to get through the 50-miles. So before getting in to the details, let’s back up a bit to help explain some of the lead up to Saturday. I started off the 2017 calendar year in really good form. Despite our horrible winter, I was able to put in a ton of miles, with my big early-season goal to really nail it at Diez Vista 100. Come race day though, mother nature had different ideas. Instead of getting to put some really solid fitness to the test, I got hypothermia and a DNF. After such a disaster, most people would have shut it down for a bit to recover from the stress and strain… not me. I was pissed off, so I pushed the gas pedal even harder, trying to make up for the lost opportunity. I can’t say for sure whether I actually believed—at the time—that it was the right thing to do (skipping any recovery and jumping right back into a huge training block), but it’s the path I chose. In hindsight, it was so obviously the wrong thing to do. As I’m sure you can predict, I started a gradual spiral into burnout — filled with a bunch of tired/lacklustre races, and an emotional low point. Unfortunately, the lowest of the low came at Knee Knacker a few weeks ago. For the first time, when I lined up at the KK, I had no desire to be there. I went through the motions, but I was broken… and it showed. The day after Knacker, Nick and I went rock climbing, and I told him that I was almost positive that I wouldn’t race Squamish 50. I was just so tired and emotionally drained. I couldn’t imagine putting myself through a huge effort like SQ50. With SQ50 off the plate, I felt a weight lifted off my shoulders. I could ramp up my climbing and not worry about any focus on running. For the next few weeks, I just went out and had fun. I managed to tackle a few classic Squamish Chief multi-pitch routes, but I also got out for several long, easy days in the alpine—very low intensity, and without much structure—just having an adventure. And then it happened… one day last week I woke up as if someone rebooted my mind and body after a full system upgrade. I felt snappy and fast while running, and I really wanted to race again. I was back from the dead and ready to race SQ50! Maxx takes off at a slightly fast pace, but my legs feel good, so I stick with him (staying about 50m back). We get to AS1 in just under 40 minutes… pretty quick. I run a strong leg to Alice Lake, coming in right under 1:40, and perfectly on my goal pace. Maxx has put a couple minutes on me, but I feel totally in control. I do a ‘soft’ roll of my ankle around Four lakes, but nothing to slow me down. When I come through the corners AS for the second time, I’m still feeling great and on plan. I’m told that Maxx has almost 6 minutes on me now. That would put him right around CR pace… which was never in my game plan. I’m content to run my own race, and just see how things unfold. I went through a slight low point while on a section up Galactic. I had to do a couple bits of hike-run to make sure I was getting in the fuel that I’d need for the 2nd half of the course. I crossed the creek at the top of Galactic, still on perfect pace, but soon realized that I wouldn’t be able to open it up (like I would usually do) on the long downhill to Quest. I just didn’t have the confidence in my ankle to crank it. When I popped out at the Word of Mouth AS, Gary was there, and he let me know I was only 2.5 minutes back from Maxx. Very interesting! I made up the 2.5 minutes to Maxx before we got to Quest. It was obvious that he was paying for the fast start. I came in to Quest about 5 minutes down on my goal pace, but I was feeling really strong and focused. In and out of Quest, and now it was time for me to blow the race apart. The plan was to put in my big move of the day up the Climb Trail. Nick has always killed that climb, and I wanted to seal the deal on the win in the same fashion. My strongest section of the course was up climb trail. I was fast and I ran it all… killed it! I made up more time here than I had given up on the decent, and I was back on goal pace. By the time I got to AS6, I’m betting I had close to a 20-minute lead. At that point, I felt it was in the bag. I just needed to hold a steady effort to get my 7:45. Then the twinges started… my adductors started to tease that they were going to cramp. And it just kept getting worse and worse. Over the next 2 hours, I was randomly crippled by massive leg cramps. I would be frozen in my tracks, in incredible pain, as my legs painfully seized up. Any idea of running under 8 hours was now out the window, and I was just in damage control mode. As long as I could just keep moving forward, I was pretty sure I still had the win in the bag… but keeping moving wasn’t so easy. It got to a point where there was a sweet spot speed for me to run at, which held off the cramps. But as soon as I changed speed, due to a hill or a turn, I’d be crippled as my legs locked up. I’d stand frozen in agony for a couple minutes, then finally get some release and get back into that sweet spot pace… until it happened again. This was incredibly frustrating, but I didn’t panic. In general, the last leg from Far Side to the finish, was just ugly and painful. But there was no way I was going to let the race slip away, even if I had to crawl! Running through the finishing chute was pretty incredible. I did my best to soak up the moment, as my girls and my sister’s kids all ran with me across the finish line. So many of my friends (and family) were there, and it was a huge high. As I said to Gary, “winning the SQ50 is the most significant accomplishment in my ultra running career”, and that’s because I feel so many people were able to take a piece of ownership to my performance out there. Thank you Squamish, and the Capra crew, for just being so damn awesome!